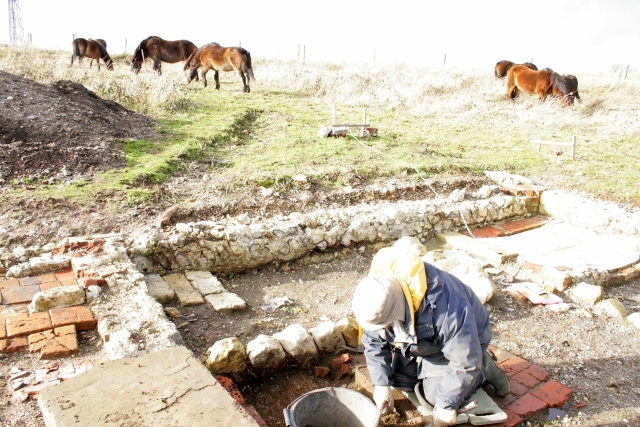 Exmoor pony looking at excavation in front of cottage. Sunday was too wet to dig, so we returned Monday, especially since the sun was shining! 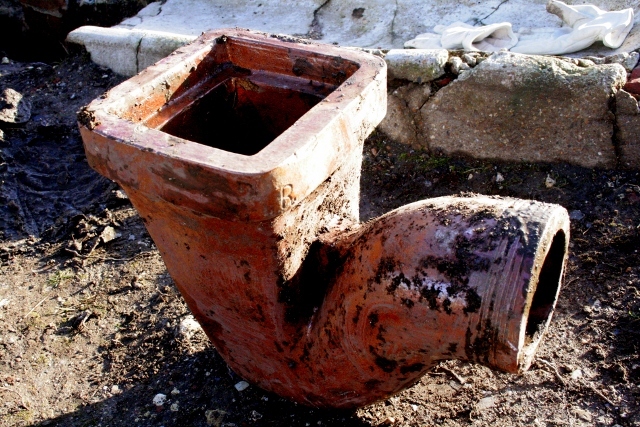 4″ salt glazed stoneware drain pipe. 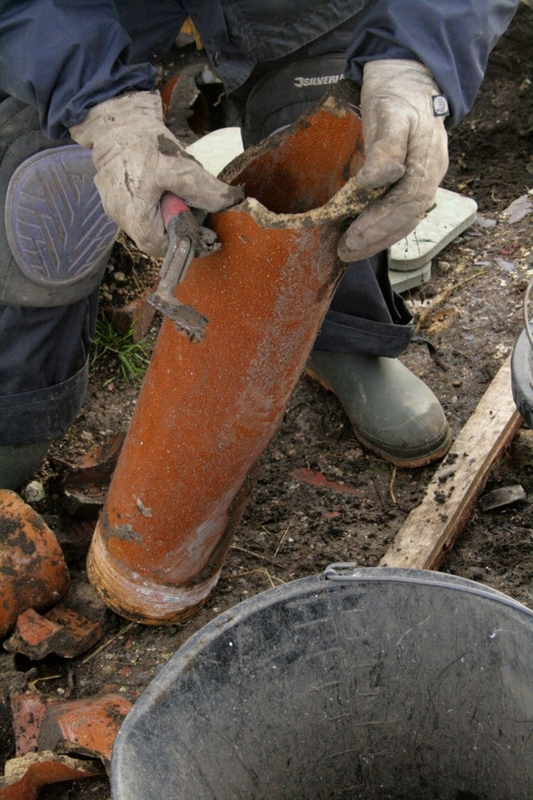 The first metre (2 lengths) of the 4″ ceramic drain were removed. 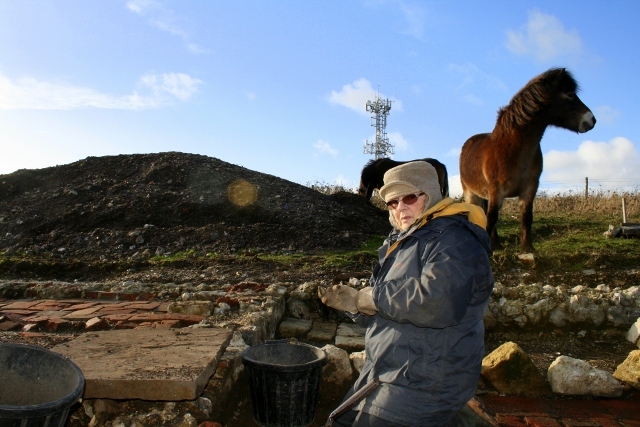 It continued without signs of any blockage for at least another metre under the demolition rubble mound, towards the site of the cottage’s vegetable garden. The inside of the excavated sections were relatively clean, with no finds except for a rusty nail. 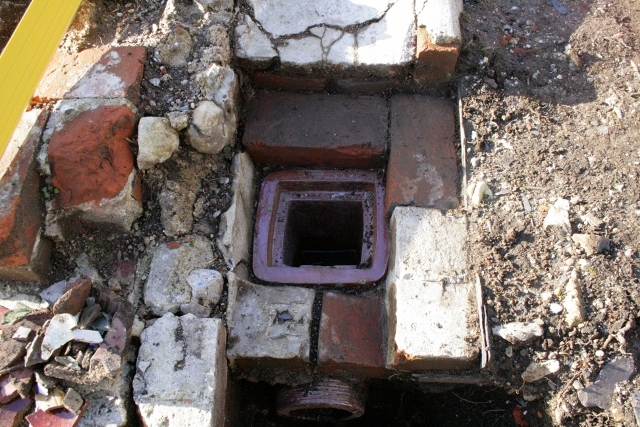 The unexcavated length of drain continued freely for at least another metre. 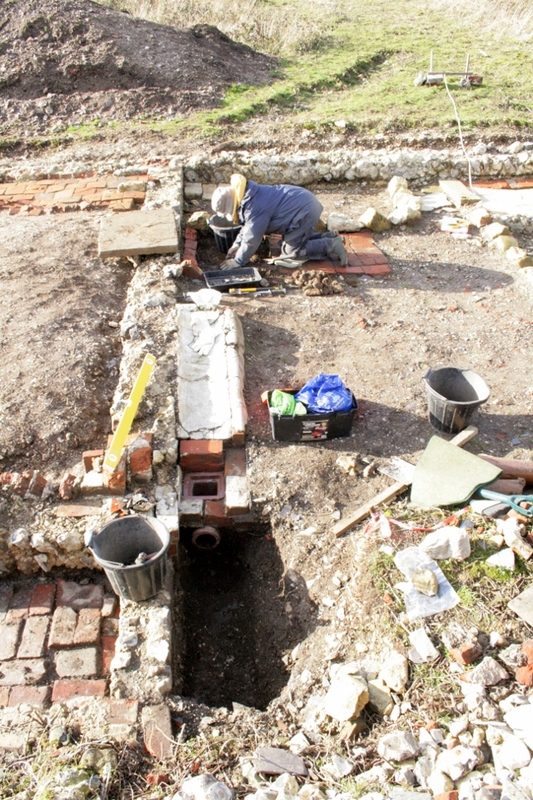 The fill of the trench in which it sat was further excavated and a number of mostly ceramic finds were found, probably mid-late 19th c.
The gully drain which fed it was also fully excavated. Fewer finds were found associated with the backfill of its construction trench, and there were no new finds from inside it – except for some foul smelling debris which had accumulated in the trap since it was excavated earlier in the summer. 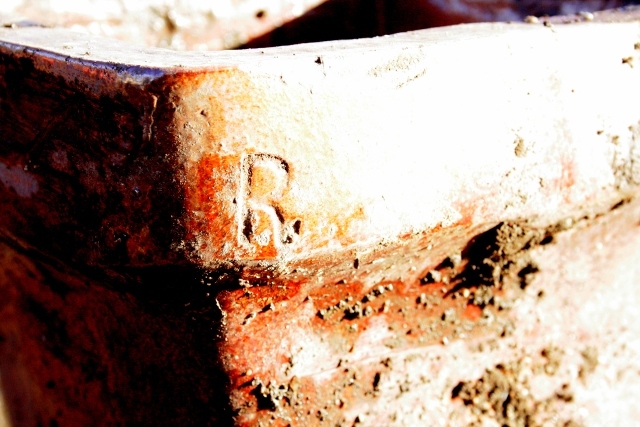 This salt glazed stoneware gully drain bore, on the external face of its rim the initial ‘R.’. 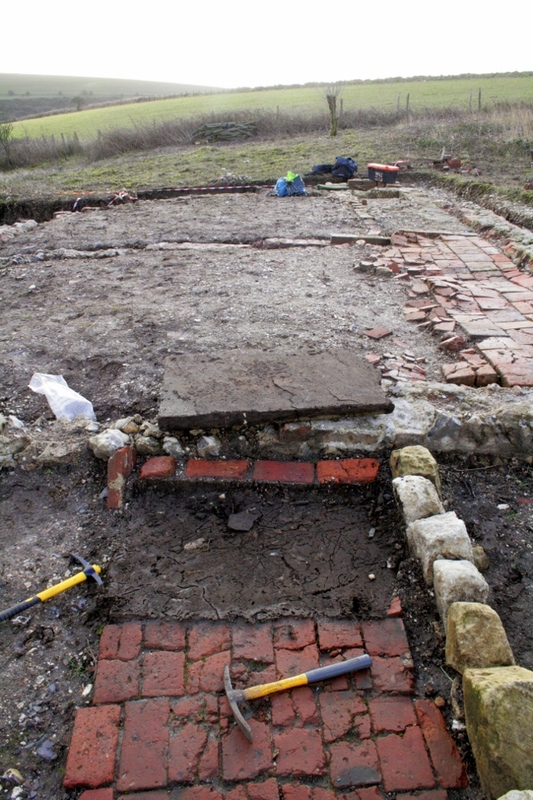 Also fully excavated was the stone slab which formed the front door-step, and the single row of unmortared bricks directly between its south side and the front of the cottage. Sussex Brick Estates Co. Ltd brick, part of front doorstep. 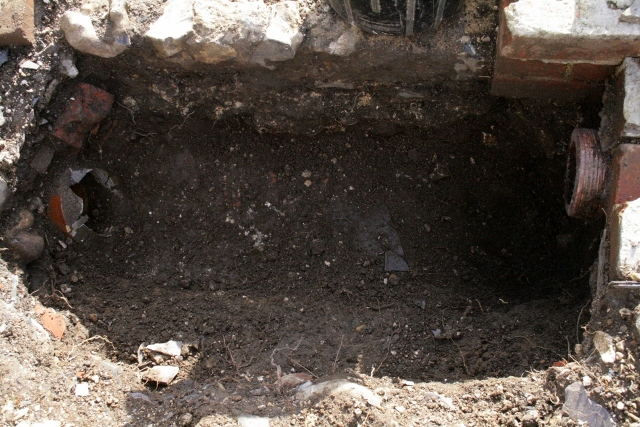 A small quantity of finds were discovered, including a shard of pink and white cased glass similar to that commonly found at the base of the demolition fill in this area. This indicated the possibility of a later date to this feature. 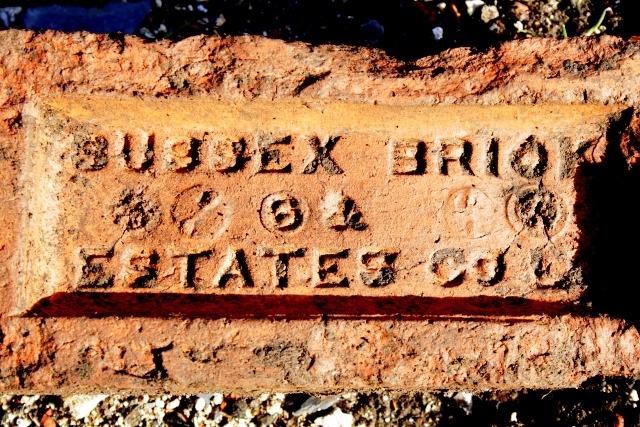 This was confirmed when just one of the bricks which formed the back of the front door step was found to be one of the very few ‘Sussex Brick Estates Co. Ltd’ bricks excavated on site, and the first entire, in-situ example. It apparently dates to between 1922 & ’30. The other bricks were unfrogged. So we now have evidence for various repairs & improvements having taken place over a longer period than we had originally thought. Combining documentary (OS map) and oral history, these indicate the possibility that our ‘posh’ outside toilet may have been rebuilt sometime between 1930 & ’34. Therefore, I am also considering its partial excavation in search of dating evidence, as well as the digging of a sondage in front of the cottage in search of a possibly backfilled well or water-tank, for which we have oral evidence, but of which there was no sign when the yard surface was excavated earlier in the dig. And if you didn’t already know – I loved the recent visits by the Exmoors, no matter how naughty or distracting they may have been!